Starved Rock State Park offers dramatic views along the Illinois River all winter long. It’s also the sight of many adventures, including eagle nesting and sled dog demonstrations. 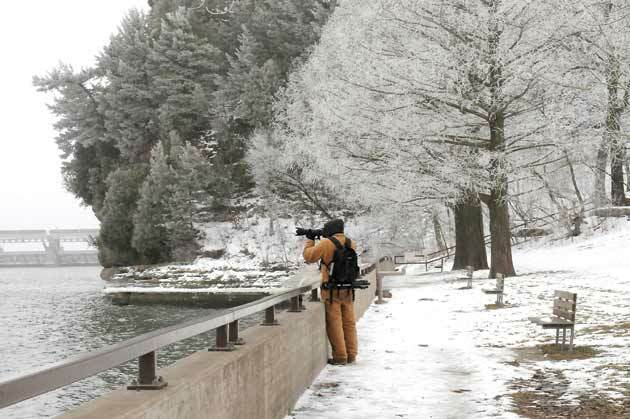 The first snowfall of the season opens the door to a whole new world of outdoor fun at Starved Rock State Park and Lodge in Utica, Ill. Located about an hour south of Rockford on I-39 and less than 90 minutes from Kane & DuPage counties, Starved Rock welcomes eagles and waterfowl each year, among other beautiful sights. When waterfalls freeze, the park becomes a great place to hike, explore and take photos. Ice climbing is permitted in mid-winter, for certified climbers who register. Cross country skiing is available, when snow permits, at Matthiessen State Park (just south on Route 178). Inside the Lodge, the roaring two-sided fireplace is aglow, welcoming visitors from all over the world. The rustic dining room is open daily for breakfast, lunch and dinner. Sunday Brunch and holiday buffets are guest favorites. Reservations are a must. Lodge rooms are comfortable and log cabins in the woods really offer a winter getaway; some even have fireplaces. After a hike through the winter wonderland, there’s nothing like a therapeutic massage followed by a soak in the hot tub and a few minutes in the sauna. There’s a massage cabin on the property and the indoor pool complex is refreshing and warm, even when it’s below zero outside. The Lodge has two trolleys and offers “Discover the Eagle Trolley Tours” that are both fun and educational, through February on Mondays, Wednesdays, Saturdays and Sundays. Sighting these majestic birds is a thrill for all ages. Sled Dog Demos on Feb. 20 offer spectators outdoor demonstrations (at the Visitor Center) and indoor educational presentations (in the Lodge). This is a great way to learn about the fascinating characteristics that made the Siberian husky an irreplaceable teammate on Iditarod teams. The Illinois Audubon Society hosts exciting exhibits at the park this winter. Free lectures are presented on “Birds of Prey” by the World Bird Sanctuary, where live eagles and falcons fly over your head as you learn about these amazing birds. This is quite an impressive show for seniors and youngsters alike. Not to be missed is the 3rd Annual “Artists of the Valley” & Native American Drum Circle on Sunday, Feb. 27. Here, you can listen to Ojibway tribal songs and stories in a drum circle led by Ron Kanutski (Mushkiki-Gizhi-baa-sense-Kwaa, Bear Clan). A piano and flute lecture by Bill Buchholtz will follow. The public is also invited to visit a free art show in the Starved Rock Room. Starved Rock has an extensive collection of woodcarvings and outdoor sculptures called “Art in the Park.” Four new carvings were added in November, including “The Leaning Tree,” which is now the tallest sculpture in the free outdoor exhibit, which is wheelchair and stroller-friendly. This entry was posted on Tuesday, February 1st, 2011 at 10:07 am	and is filed under Uncategorized. You can follow any responses to this entry through the RSS 2.0 feed. Both comments and pings are currently closed.